Friendly Social Club host to regular entertainment, creating a social and comfortable atmosphere for our members to relax and enjoy. 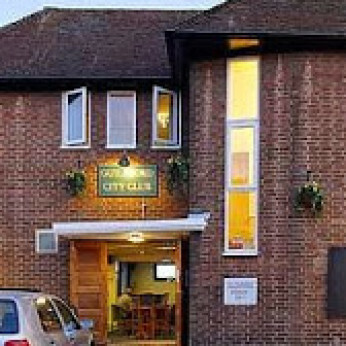 Situated in Joseph's Road, Guildford, Guildford City Club is a relaxing place to enjoy a drink. Whether relaxing on the terrace, sitting at one of the the bars, watching one of the big screen televisions or playing pool on the free table, snooker or darts, the City Club offers a clean, quiet and comfortable environment. The club also has an enviable reputation for hosting some of the best bands and best music nights, including the now legendary CityFest each October, a weekend of great bands. Sited in a convenient, mainly residential area close to the Ladymead by-pass and just a short walk to the town centre, the club features a quiet, secluded tree lined terrace, with ample seating. Out front, the club has plenty of on and off-street parking. On the ground floor the club has a pool table, three big screen TVs (with Sky Sports & BT Sports), seating for 60, fruit machines, the latest on-line jukebox and a beer terrace with seating for 40. Upstairs the club has another bar and a full size championship size snooker table and two balconies.